I've been looking back over some of the projects I've made over the last two years, and following on from yesterdays theme I thought I'd share one of the projects from my journey down memory lane with you. 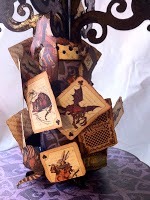 This was one of my Graphic 45 DT round 1 entries back in Feb 2012. I can't believe how quickly the last two years have gone and it was great fun looking back through all the projects and seeing how my creative style has changed too. 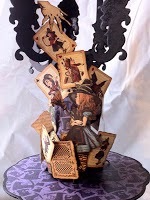 This little ensemble was made from a cardboard Christmas cake stand and Halloween candelabra I picked up for next to nothing in a sale, one toilet roll, devoid of paper and of course the fabulously wicked Halloween in Wonderland papers. Some of the first I bought from Wendy at the Stamp Attic. I loved that collection and still have a secret stash of them tucked away. Here's some close ups of the top decoration. I was wondering how many Graphic 45 collections have had the colour purple in them. If you know the answer just leave a comment below. 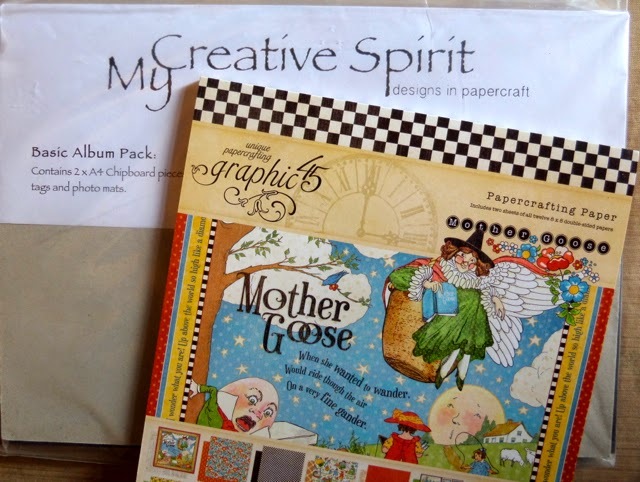 All Comments with the correct answer will go into the draw for this months giveaway which is one of my album packs and an 8 x 8 Mother Goose paper pad. The winner will be announced here on the blog on 31st May. Good luck if you're entering. Do call back tomorrow, when I'll be sharing some of the fabulous samples made my lovely friends Lyn Jones and Karen Richards for the Graphic 45 Create and Craft show at the end of April. With three counters to fill with samples it was great to have their help this time. Enjoy the rest of your day and look forward to catching up again tomorrow. 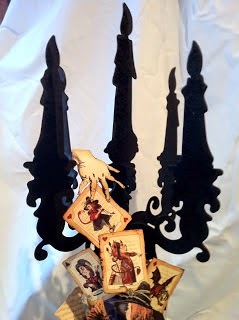 Hello Clare, well it isn't May 8th yet here, lol, but loved looking at your Halloween candelabra/cakestand!! My guess is maybe 5 Graphic 45 Collections have purple in them!!! Not sure, just thought about what ones I had and knew about, possibly there are more!!!! Am getting ready to go to bed since it is 10:22 p.m., May 7th here!!!! See and talk to you tomorrow!! fab design and very beautiful made Clare it looks fantastic. Well I never have use graphic 45 but my guess is 7. Clare....I don't need to be entered into the drawing...I just want to say how very much I will miss your beautiful work on the G45 team. You created projects that were absolutely divine...and do-able..and affordable. I shall miss that very much. Fortunately I follow your blog, so I will stay connected. I just love your work and your creative spirit inspires me! Best wishes for the future! Hi Clare, A really lovely 'trip down memory lane', this was one of my most favourite collections, I wish we could still get it, I am an 'Alice in Wonderland-aholic' and I just adore this collection. As a beginner, this isn't easy, but I guess 8... Love how you made your cake stand! Oh dear, that's difficult, but I would say 13. I'm going to have to go with 8 papers lines. Some of those Halloween ones are so beautiful!!! I think there were 8 collections with shades of purple. Love the Halloween art Clare. there are 6 collections (new and old), 7 if you count the core'dinations paper that goes with all the collections. Thanks for the chance to win and I love all your videos and tutorials. Keep inspiring all of us! My guess is 6 : Sweet Sentiments, Botanical Tea, Secret Garden, A Place in Time, Happy Haunting and Bird Song.Plus the core-dinations papers. I had to go and look at the ones I had which is not all of them....so I have to just guess and say 7 which is my lucky number. hi Clare thanks for making us all have to think lol i am going to guess 6. I think most but I'll say 10. I think 4 collections have purple. your use of Graphic 45 is always inspiring. I love this that you made. My guess is going to be 6. Have a good day. I tried thinking of all the collections and did some googling! I think there is 8! thanks for all your great videos! I think that only four of them have purple. Thanks for the chance to win this wonderful prize. I don't really know graphic45 so I'll guess 6 thanks for the chance to win. Be Blessed and thanks for having a giveaway!!!! Hi Clare I guess 7. Hello. Thank you for this opportunity for a chance to win. From what I looked back on I think (and this is for sure a big guess) I'm going to say 11. I want to say all of them had a touch of purple, but I'm going to say 11. Again, thank you. Thank you for the chance to win! I am going to say 9. 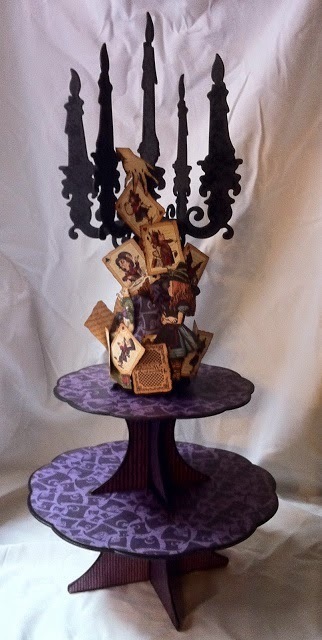 I Love your Halloween in Wonderland cakestand!!! That was such an amazing collection! I wish it was still available as it can out before I started papercrafting. 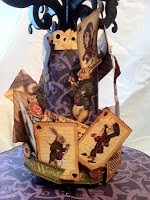 I have only been papercrafting for a about a year and a half. Thank you so much for all of your amazing inspiration!! I love all of your designs! Hi, Clare~ This is a tough question since there are so many beautiful shades of purple that pop up unexpectedly in so many of the Graphic 45 designs. I think I will say 13, though, since it seems an appropriately spooky number. lol! I have a few of G45's lovely collections and many seem to have a splash of purple somewhere, so I'm going to guess at 11.